Gazebos, arbors and pergolas create a great outdoor space for you and your family. The beauty and rustic feel lend to an environment where you can sit out and enjoy nature, host a great family dinner or simply provide a tranquil environment to sit back and relax. 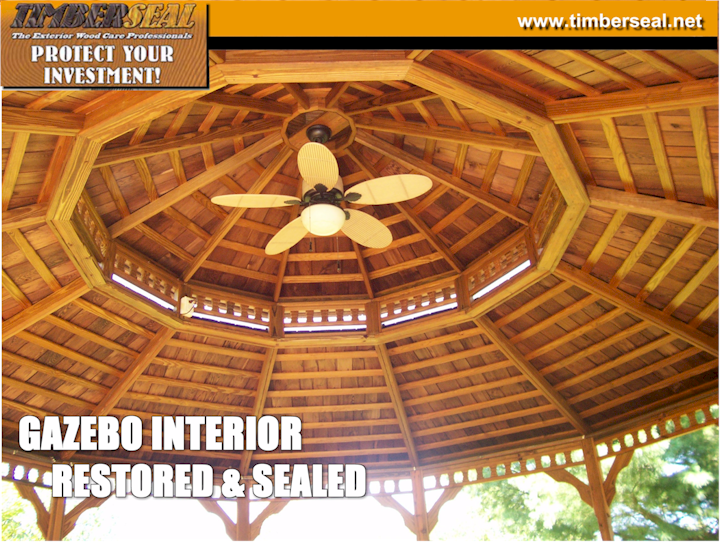 Preserve that sanctuary by making sure your wood gazebo, arbor or pergola is cleaned and sealed every few years. As with your deck, fence or siding wood gazebos, arbors and pergolas require cleaning, staining and sealing every 2 to 4 years. In the photo above you’ll notice before and after photos of our cleaning and brightening process. On the left is a weathered gazebo that has UV damage set in (the graying of the wood otherwise known as photodegredation). TimberSeal applies a restorative cleaner designed specifically for exterior wood that breaks down the UV damage, accumulated dirt, mold and mildew and allows us to wash and restore the wood at a very low pressure. Following the cleaning a wood brightener and conditioner is applied to the structure to further open he pores and remove any tannin or iron stains. Once dry the result is seen in the third photo on the right. 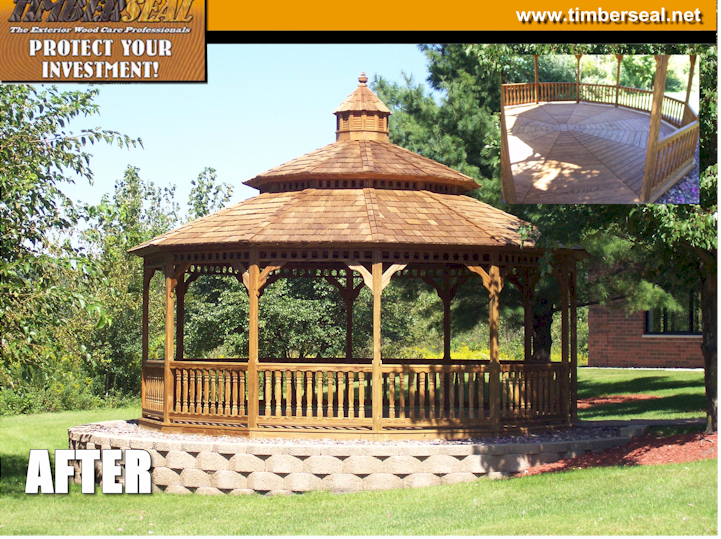 At this stage the gazebo has dried for a period of 2 to 3 days and is ready to be sealed using our TimberSeal Pro-UV Oil Finish (click here for colors). 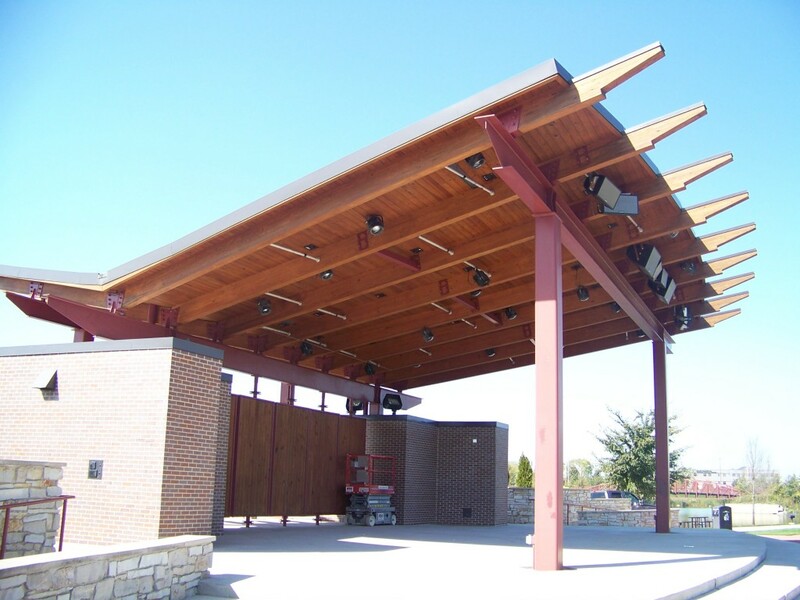 For a free no obligation estimate on your residential or commercial gazebo, arbor or pergola give us a call toll free at 1-866-WOODCARE or locally at (219) 548-2670. For your convenience you may also submit your request through the link below.